Blah Blah Blog: I Paper Scrapped! So here is my page. 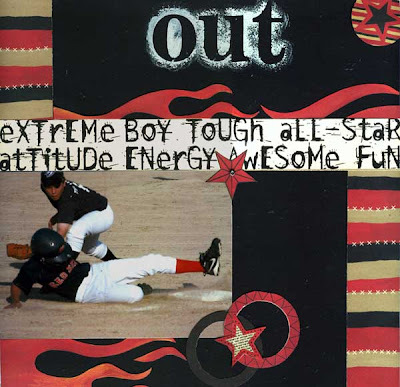 I used Teresa Collin's of Junkitz Extreme Boy Line. Love it!!! I've been waiting for a special photo to use these papers, I think I found it! Hope you all have a fabulous day! See ya tomorrow hopefully if I have anything to post about! Pam! That is fantabulous! I am totally loving that LO. You are right, the picture is perfect. I cannot remember the last time I paper scrapped...toooo scary! This is really cool. I love ir. Thanks for sharing the link with me!!!!! Very cute Pam!!! I have got to get my scrapping mojo going, it is gone for now . . . I would rather blog. I like that line of paper too, need to get some!!! We need the rain, so I don't have to go water our lawn!!! This is an awesome page and the pictures are perfect for that paper! Love that layout! The papers and photo go together perfectly. I also scrapped, like a maniac, to finish my niece's graduation album. I liked the result, hoping she does too. I didn't get to see her open it. I'll have to add a few pages after tonight for her graduation and grad party pictures. Love this layout Pam! awesome job!